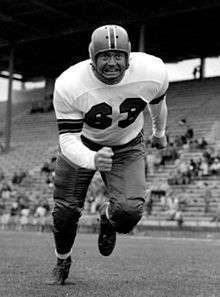 Arnold George Weinmeister (March 23, 1923 – June 29, 2000) was an American and Canadian football defensive tackle. He went to four Pro Bowls, but with only a six-year tenure in the All-America Football Conference and National Football League combined, his career is one of the shortest of any Pro Football Hall of Fame member. He was born in Rhein, Saskatchewan. Weinmeister was a two-time All-City tackle in high school, and played end, fullback, and tackle during a 4-year tenure at the University of Washington which was interrupted by four years army service. He was scouted by New York Yankees (AAFC) head coach Ray Flaherty while playing fullback. Weinmeister turned professional in 1948 and played defensive tackle for the New York Yankees in the All-America Football Conference until 1949, and for the New York Giants from 1950 to 1953. During his final season in New York, he served as the team captain. In 1949, Weinmeister won second-team ALL-AAFC as a rookie followed by first-team ALL-AAFC honors, was voted ALL-NFL Choice for four consecutive years (1950–1953), and was selected to play in the NFL's Pro Bowl every year from 1950 to 1953. He was on the inaugural roster for the BC Lions in 1954 and played for the team for two seasons. He is one of only three Saskatchewan natives to make it to the NFL (the other two being Jon Ryan and Rueben Mayes). "Arnie Weinmeister". Find a Grave. Retrieved September 19, 2010.